It is such a beautiful day here today, despite the rain. And I don't mean beautiful as in everything is going my way, I sure am having good luck kind of day. I mean it is an aesthetically beautiful day. Ignore the half upholstered couches and not-finished paint job in the den. Ignore my sewing mess all over the dining room table. Ignore the weeds in the yard that look more like trees. And ignore the popsicle-sticky, applesauce-in-the-hair, still-in-pjs children. This will soon be beautiful in my front hall. 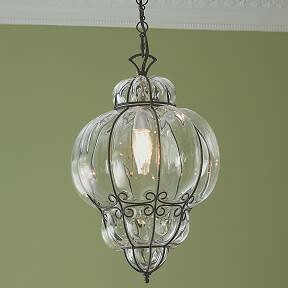 I have never, ever bought a light fixture. And I have never, ever bought anything from Shades of Light. But I have always wanted to! I have sold enough clothes at the consignment store to purchase my first beautifying home decor item from Shades of Light. I also want this and this (round). I could not be more thrilled with the outcome. I spent the entire process screaming in my head...can you believe what this looks like?...how is this so easy?...i am so proud of you!...you're doing it! This is one of the first tutorials that I found. I found it on the Pink Penguin website. The directions are super-easy. Her baskets are made with soft colors, patchworked, and often with Japanese fabrics. Mine is totally different, but that just shows how easily you can make a project fit you. 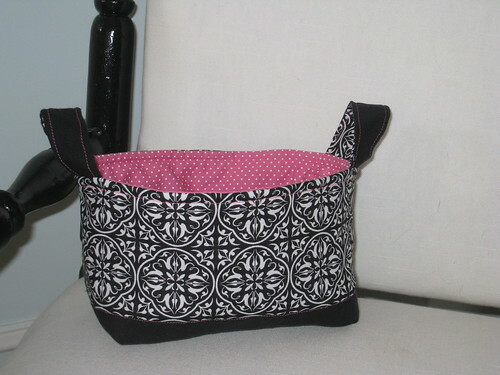 Or whomever you might be gifting a cute little fabric basket to! Your fabric basket is fabulous!! I love the pink stitches and the polka dots lining! I love the light fixture and the rug is gorgeous..I want one too! WHere do you consign the kids clothes? They're always dressed so cute. When I have little ones, I want to stock up on your castaways!